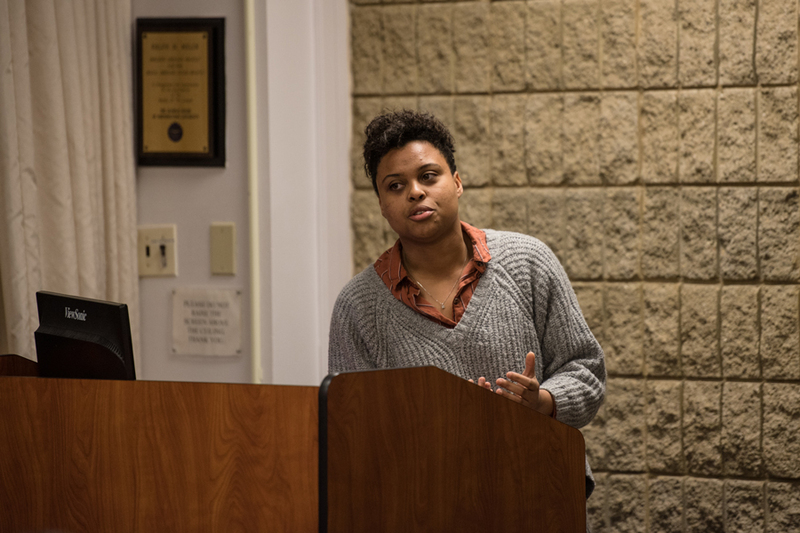 Sky Patterson speaks during an ASG Senate meeting. Patterson is running for ASG president with running mate Emily Ash. The Office of Student Conduct will look into whether members of Weinberg junior Sky Patterson’s campaign for Associated Student Government president violated the Northwestern directory policy, but a formal investigation has not been launched, said Lucas Christain, assistant dean of students and director of student conduct. On the morning of April 4, Patterson’s campaign sent an email through the email marketing service MailChimp to roughly 4,000 students, campaign manager Jillian Gilburne said. About 30 members of Patterson’s campaign team obtained the emails by compiling a list of Facebook friends from Northwestern and then finding their information on the NU directory, Gilburne said. The campaign collected data on students’ email addresses and — in some cases — class years, local addresses and Greek affiliations. Members of the campaign then put that data into MailChimp, which states that recipients of emails sent through the service must give the sender permission to use their email addresses. MailChimp also requires people sending an email through its platform to check a box indicating they have permission to use all the addresses listed. NUIT service delivery manager Josh Naylor could not be reached for official comment. Christain would not comment on whether Patterson’s campaign violated the directory policy, adding that the University’s policies are separate from external entities like MailChimp. The Office of Student Conduct will focus on determining whether it needs to follow up on this matter, he said. Kevin Lee, who is a lead student consultant at NUIT, said he could not comment on behalf of NUIT. However, after discussing the campaign email with two other NUIT student leaders, he said he believed the MailChimp policy was violated because it requires active consent. Lee added that the student leaders agreed the campaign misused the NU directory, but said he didn’t think it was a violation because the policy is written very broadly. Patterson, who is running alongside Weinberg junior Emily Ash, denied that any policy was violated and added that past campaigns have taken similar actions. Before beginning the process of collecting information from Facebook and the NU directory, Patterson said her campaign asked election commissioner Dillon Saks if her staff was allowed to implement this process. Saks said he told the campaign not to use pre-existing ASG listservs to send emails, but that campaign staff could send emails out to a list compiled independently. He said he was unaware of the NU directory policy until Saturday afternoon, but declined to comment on whether knowledge of the policy would have changed his decision. Saks declined to comment on whether MailChimp’s policy was violated. McCormick freshman Spencer Colton, the tech director for Patterson’s campaign, said the campaign had never intended to collect students’ local addresses. Some team members mistakenly took students’ addresses from the directory and entered them into MailChimp, Colton said, but he estimated this was only the case for very few students. Colton also confirmed that once concerns were raised over the campaign having the data, all of the data was deleted. Although he doesn’t believe any policies were violated, Colton said the campaign does not plan to send any future emails using the information it collected. Past campaigns for ASG president and executive vice president have used similar strategies to reach students, multiple people said. Isaac Rappoport (Weinberg ’17), who served as chief of staff during Christina Cilento’s (SESP ’17) term as ASG president, said he worked on three campaigns during his time at NU, all of which used a similar system, including sending mass emails through MailChimp. Rappoport said he believed neither the directory policy nor MailChimp policy had been violated by the campaign, and added that NU students have the ability to opt out of displaying certain information on the directory page. Students can choose to not display their curriculum, local addresses, permanent addresses, phone numbers and Greek affiliations but cannot opt out of displaying their names or email addresses. At ASG Senate on April 4, just hours after the initial email had gone out to students, a member of Justine Kim’s campaign for ASG president approached Saks and asked where Patterson’s campaign had gotten the list of students. Saks said he responded that Patterson’s campaign had created the list independently and that the use of the directory to find students’ emails was acceptable due to precedent. Still, Kim said her campaign did not feel “comfortable” sending out emails through MailChimp and opted to reach out to students through different means. She said she believed both directory and MailChimp policies were violated by Patterson’s campaign. “It’s a really dangerous precedent to set for ASG specifically as a body and for the election process to be actively violating the democratic process along with literal rule that had been laid out by the University itself,” she said. At the bottom of the April 4 email, students could click “update my preferences,” which led to a webpage affiliated with the campaign that showed all the data the campaign had collected on them. That information was being stored in MailChimp before it was deleted — and part of students’ concerns was that MailChimp isn’t secure because it had experienced data breaches in the past, Colton said. Patterson said she wasn’t sure whose idea the email strategy was, adding she didn’t know the campaign used MailChimp until Friday night. She said she didn’t believe the service’s policy was violated but still wanted to address the issue. This story was updated at 12:45 p.m. and 4:04 p.m. with new information from Office of Student Conduct director Lucas Christain.